The Fourth Sunday in Lent: March 31, 2019 – Rev. Canon Dr. William J. Danaher Jr.
One of the big surprises in my life that I have made over the past few years is that there are things that I have that are gifts that are given to me that I have not worked at all to get. There are things that just came my way without any kind of effort, any kind of striving. And part of my job is to simply accept that gift and to celebrate it. And early on in my ministry, the primary gift that people tell me I did well. They said I said the Eucharistic prayer beautifully. And when that gift came my way, I had to say I struggled with it a little bit because at that point I was working to complete a PhD in Religious Studies. And I was hoping that they would notice, say, my preaching and say that my preaching was wonderful. And I would always say, “Well, how was the sermon?” They’re like, “That’s good but you really celebrate well. Just keep following that.” So sometimes these gifts are a little bit hard to hear but they are important for me and for us to hear when they come our way. And over the past few years, one of the gifts that have been given to me, one that I didn’t know I had is the ability to be with someone when they’re grieving and to be with them to lift up the deceased loved one at a funeral. For reasons that are complicated, I am able to do a good funeral. And this is an incredible gift. One that I’ve had to receive, and to celebrate and to lift up. And over the past few years I’ve been wondering why is it that I can do such a good funeral? And I suppose, what I’ve realized is this, is that I have been given another gift. I have been given the gift of coming from a phenomenally dysfunctional family. I have been given, not just – this is not just like phenomenal in terms of like Oprah phenomenal. I mean like really bad. Like my father was shot and the bullet was three inches from his heart. And the fact that he survived is a miracle and living with that. I have also a father who spent a week in jail. I have a father who struggled with alcoholism. And this is just to paint the smallest part of the tapestry of the dysfunction in my family. My parents were married previously to other people, got divorced, got married, had me. My older brother is from my mom’s first marriage. My father adopted him when my brother, his biological father didn’t want anything to do with him. So I come from this incredible, mass of dysfunction. This incredibly complex family system. And the gift of that complex family system is I have this database to draw from when it comes to talking about people as they are trying to mourn a loved one and then put together their own complex family system. And that has become an immense gift to me to be able to pull from my own experience to help and identify with someone as they are trying to come to terms with their complex family system. And there’s more to it. I also have this awareness. Based on my own family of origin that though I came from tremendous dysfunction, my parents and my immediate family were committed to growing spiritually and emotionally. And so, I am profoundly grateful that I had a father who just as much as he could do some incredibly reckless things and dangerous things, he also was committed to dealing with his alcoholism and growing from that. And that has given me an antennae, if you will, for all the ways and every complex situation I encounter that I can see God’s reconciliation at work. And that antennae I see as that reconciliation and that witness to the resurrection in even the smallest thing. And that has been a profound gift because what is most important to do when you’re a pastor of someone who is going through grieving and when you’re presiding at a funeral is to bear witness to the resurrection. And the more I listen to the story someone tells me of their life and all the complicated family systems around that death, the more I can see the resurrection at work in those moments. And that I think is what it means to be in part what Saint Paul talks about today in the epistle, that is what it means to be an ambassador of Christ, and it’s a profound gift. I didn’t know I had it. It was not something I worked for. Except maybe to survive my family of origin. But in fact, it has been one of the greatest gifts God has given me. And I am grateful for it because I’ve seen how much fruit it bears when I’m with those of you that I’ve had the privilege of walking with when you’re mourning and giving thanks for the life of someone who has entered your complicated life. Now I begin this way because I want you to see something that is key in our gospel today, and an important thing that you need to see in this gospel passage. Because it’s easy for us, because we know this paradigmatic parable so well. We know it so well that we easily will fall into the kind of allegories that have been done over the years to communicate the message of this parable. And we could see those allegories well because for many years, the younger son has been seen as the parable, as the kind of paradigmatic image of someone who is coming to know themselves and coming to know God. And then finally, one of my favorite stories – one of my favorite titles is from a friend of mine who is a feminist theologian. She says, “This is the parable of the missing mother because where is she? This is the weirdest family system I’ve ever seen. Where is the mother?” Right? Is this like Batman and Robin times two? What is this? What a weird family. And that gives us, I think, the key because the key is not to allegorize this parable but to see it as a very complicated family system that Jesus is talking about. And part of the message of this gospel today is that the reconciliation of God and the resurrection can break forth even in complicated families, even in families in which things don’t always seem to fit together neatly or tidily. So that is a Rabbinic sermon that made that kind of message something in the water. But Jesus when He tells it complicates the story. He makes it about two sons. And He makes it about a father who is running both ways. It’s about a father who is completely surprised to discover that the son he has lost is not the son who was gone on a journey, but is the son that is next to him that he’s overlooked. And it’s in that complication that we find the gospel that Jesus is speaking about. Because Jesus is not trying to align people or to assign roles when He tells this parable. Jesus wants us to see how the gospel makes its way and how reconciliation makes its way even in complicated situations. And all of this is to go with the grain of His own incarnation into our complicated world so that reconciliation might happen. And this is why all the way through the gospel, the father keeps on speaking words of resurrection. The son who was lost is now found. The son who was dead is now alive. The father does not represent God in heaven, but rather a human being who is trying to make his way in an incredibly complicated situation to somehow bear witness to the reconciliation of God and of the resurrection. And so it is no mystery that this parable represents the middle of the gospel of Luke. It represents directly the middle of the gospel all that Jesus has said to that moment and all that Jesus will do as He makes His way to cross and resurrection. This parable is meant to be a kind of message and summary of God’s action in Christ in our midst. And it’s when we look at this gospel as something that applies to the complicated nature of our lives that we begin to experience the gospel anew. We begin to experience the teaching anew. And it comes by the recognition that this parable actually finishes before it ends. That is to say we don’t know the outcome of this parable, and almost every other parable that Jesus tells, there is a conclusion and there’s a message. And instead, in this parable we just have the father standing with the elder son outside of the celebration pleading with him to come in. And the words the father uses to address the son, which we translate as “son,” actually is a more intimate word. The word the father uses to address the older son is “teknon,” which is child. Or we might even say, baby. 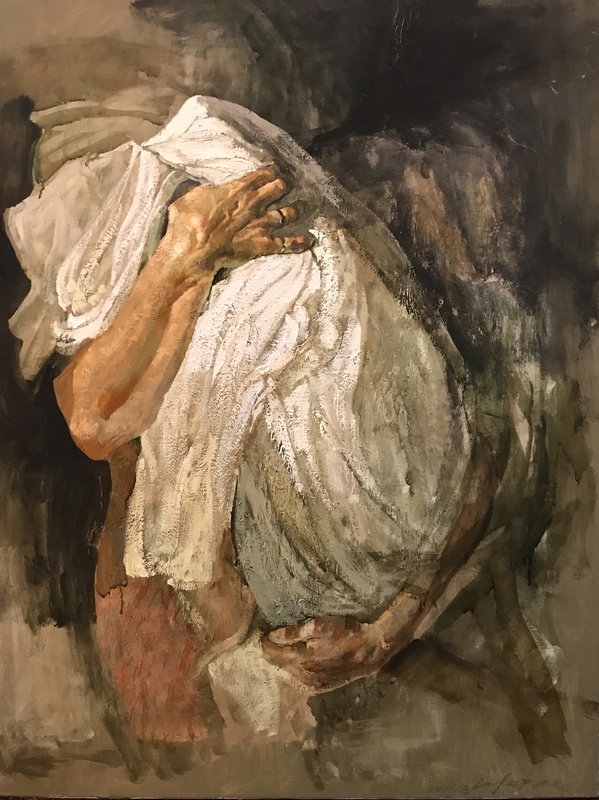 “Child, all that I have is yours.” And it’s when we see that complication, we begin to make the right application of the parable to our lives. This parable is not a way of kind of placing some kind of divine template that has been simplified onto our complex world. This parable exists to empower us to be ambassadors of Christ in the midst of our own complicated world. In my own family, my brother and I had an enormous amount of tension and conflict. He came from my mom’s first marriage. For six years, it was just my brother and my mom. And then my mom married my father, and then I came along and ruined his day. And that complication existed for decades. And it did not easily abate. There was a time in which we spent three years not speaking to one another. And then in weird ways, as people do, we began to exchange gifts. He got me care packages from Harry & David’s and Zingermans. And I began to give him little gifts for his birthday. And then we began to talk. And a couple of years ago, I said to him, “What do you want for your birthday?” because I was running out of ideas. And he said, “More of the unimpeded communication that you and I have shared this past year.” And it was in that moment I realized that our relationship had transformed, as complicated as it was and as powerful as the dysfunction was in my family, things changed just a bit, thanks be to God. The pictures I have before you are two important paintings. The first is from The Return of the Prodigal Son by Rembrandt. It was done sometime in the 17th Century, the late 17th Century. And instead of seeing this as a message about God’s love that is given from above and drops on to a world that is too complex to hear it, I want you to take a look at this painting as a witness to someone who chose to enter into complexity and to be an ambassador of Christ and of resurrection. And so the father’s face shines. And this is a reference, of course, to the new law of grace which is meant to draw and bring up in our minds the fact that when Moses descended the mountain with the 10 Commandments, his face was shining. And the two hands on the son’s shoulders, they don’t quite match up. And this people have surmised is Rembrandt capturing both paternal and maternal love of God as it is expressed in human beings. So you see, a somewhat larger hand that is meant to represent the care of a father and a somewhat smaller hand that’s meant to suggest the care of a mother. And again, this is not simply to speak about God’s love. But God’s love embodied here and now, in real time, in real place, in our own circumstances. The second picture I have is another witness to reconciliation but it is more powerful. It’s by a Bosnian artist named Safet Zec. And this is entitled in Italian because he lives in Italy, Abbraccio. Embrace. And this is a mother holding a child who has died. And the mother’s hands are a direct reference, I think, to the way hands have been depicted in the history of art. And in a way, this is a kind of piata, a kind of foreshadowing of Christ’s death on the cross. And is the moment captured paradigmatically by Michelangelo when Mary cradles her son. And here, hands are held again. And these are a woman’s hands. And they’re strong. And they’re holding on to this child and proclaiming by her very actions the love that is more powerful than death. And that to me is also a witness to the resurrection. And this woman depicted is also, to me, an ambassador of Christ. Zec paints this painting as a commentary on the genocide and the war that took place in his country. And it was in seeing those little moments in the midst of all of that horrible conflict that he sees God still at work. Lent is a time, so we read, of repentance. And one of the ways in which we need to see this parable today is as a kind of witness to the power of repentance. Earlier on, right before this parable there’s a moment where Jesus says that there is more celebration in heaven over a single person who repents than 100 people who do not feel the need for repentance. But I want to suggest to you that we need to see repentance as something other than merely confessing our sins. Because the word that we translate as repentance is metanoia, which means a change of mind. Tertullian writing in the 2nd century argued that we had gone astray when we started to translate metanoia as repentenoia. That in fact, we should call it conversion. So Lent is a time of conversion, of seeing our lives as a gift, of seeing Christ active in our midst of claiming and working to be ambassadors of Christ in the complicated world we exist, and also in accepting the ambassadors of Christ that come our way. May God give you grace to be changed. May God give you grace to see things anew. May God give you grace to know His love in the midst of who you are and may you be ambassadors of Christ and His resurrection.